A few weeks ago we held had our annual trip to see several Broadway shows. 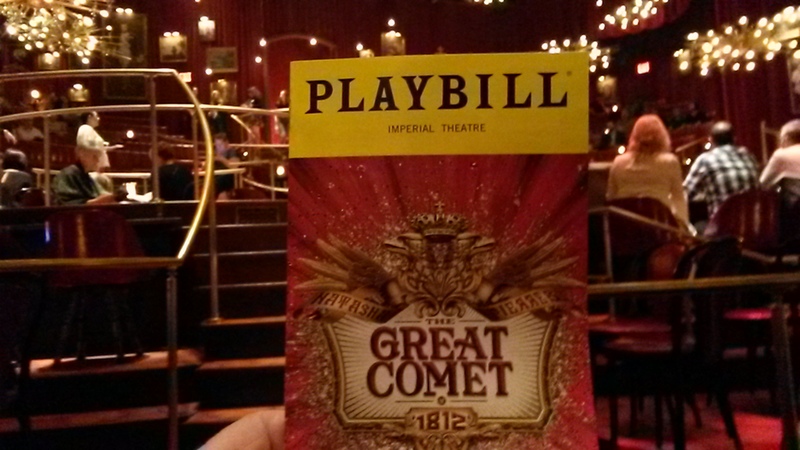 This is a review of the lighting, sound, and tech for “Great Comet of 1812” at the Imperial theatre. I’m not going to review the overall show -there are many reviews of the story and show. This is a review of tech aspects, with just a few comments about the show. For starters, let me get this out quickly before diving into the tech: I didn’t like the music nor story. And the show was vastly too long. As my wife put it, it was a long soap opera. But I want to focus on the tech! The Sound Design was outstanding. Some of the best I have ever heard. It was exceptionally difficult to do, given that the positioning of lead vocals were not only panned left and right, but upstage and downstage too. Since the audience is not just in front of the stage, but in, on, and around the stage, the speakers were hanging everywhere too. Wow, that made the job even more difficult. Many, many opportunities for feedback, but the audio was pristine. Wonderful! One of the ways the audio design team managed this difficult sound was by controlling the pit volumes to a very low level. And when I say “pit”, that’s really a misnomer – the musicians were running, dancing, and walking throughout the house and the set. Yet the instrument volumes were always below the singers and actors. No straining to hear dialog or vocals. And of course with the aforementioned challenges with speakers and actors everywhere, low pit volumes were a must. Speaking of musicians and singers everywhere, the wireless audio demands seemed extreme. The lead actors and musicians had one wireless for in-ear monitor, one for vocal mic, and the musicians had a third wireless for their instrument (violin, guitar, accordion, clarinet, etc.). With such a large cast and pit, that’s one heck of a lot of wireless channels. Certainly rivaling any huge show in Vegas, and I’ve never seen this much on Broadway. Another technical challenge well handled. There were occasional missed cues – refreshing because I know personally how easy it is to miss a cue. This it the top of the professional game, so knowing the sound tech(s) are human sometimes makes me smile. Fantastic set – the audience is woven throughout the set. Not just on side stage, but throughout the set. There were even two working bars on the set (only operating during preshow and intermission, but still…). The lighting design was driven by the set complexity. Overall, it was NOT fantastic lighting. I would say “Excellent lighting and functional lighting, but not exceptional or fantastic”. They won a Tony(R) Award for outstanding lighting design, yet I felt it was not on par with “Dear Evan Hansen” or my high water benchmark of “Next to Normal”. Sure, the lighting was functional, but it had to be with everyone all over the set. But little in the way of carefully chosen colors or blends and tender fades. Cold light and/or warm light, pounding on and off. Oh yes, some reds from above on stage front too. But not much else from the huge pallet that’s available to drive mood – except for the final “comet” bulb at the closing; that was nice. And what’s with the 6 or 8 “in your face” back lights that were on a low angle from the back of the stage? Nothing subtle about those. And of course they had LED sneakers and a rock concert number of 3000W strobes for the crazy party scene. And bare bulbs and Sputnik type chandeliers that were motorized up and down. Pretty sometimes, artful sometimes, but that’s not award winning lighting art in my book. I was underwhelmed. And my final beef with the lighting: During one song, they were pulsing house lights up and down to the music – really? I expect that in a middle school musical that is starved for lighting gear, but on Broadway – really? And then there was the house light row-chase. Yep!!! Kudos to two of my high school lighting students Jeremy and Adam who used that on many shows here in Rochester about 10 years back. In fact, it’s still programmed into the Olympia HS lighting console. I hope you both get an award someday soon. This entry was posted in General Interest, Lighting Technology, Music Technology, Theatre Technology and tagged broadway, General Interest, Great Comet of 1812, lighting console programming, lighting design, lighting technology, music, Music Technology, theater, theater lighting, theatre, theatre technology. Bookmark the permalink.